Banish those February blues at the farmers’ market…. The car park may be muddy, the stall holders a little sodden, but that’s the best excuse for some comfort eating to cheer us all up. So I’m off to Penshurst on Saturday morning for some good food to lift the soul. At the moment I can’t decide whether it will be scallops sauteed with black pudding on a bed of creamy cauliflower puree, or maybe a wonderful piece of sparkling fresh turbot baked with lemon juice and butter. For a real treat I may just opt for a venison fillet steak to serve this Saturday night, sauteed quickly, and served with a classic pepper sauce or bearnaise. And given the wet weather I think I’ll go the full monty, and make my own chunky chips with potato and sweet potato, fried in rapeseed oil then dusted with a little sweet smoked paprika. Add a pile of watercress and I’m in heaven. Though it may not seem like it, the days are starting to lengthen and a trip to your local market is a great way to get out and about and shake off the winter gloom caused by another spell of extreme weather. Local farmers and food producers are once more struggling with severe conditions and need us, their customers, even more than ever. Despite signs of optimism in the economy, small businesses are still struggling so get out and show your support this month. Healthy eaters out there should be happy, as there is plenty of great fish around caught locally and often sustainably. Lemon sole, halibut, skate and turbot are all good at this time of year, and shellfish fans should keep an eye out for clams, mussels, oysters and cockles. Local Kent and Sussex coast scallops come in this month – they even get their very own festival to celebrate the season (check out Rye Bay Scallop Week from 15– 23rd Feb details at http://scallop.org.uk) so make sure you don’t miss one of the region’s most enjoyable treasures. Try them wrapped on local streaky bacon and baked or with black pudding or chorizo. Or pan fry and serve on a creamy puree of wonderful seasonal cauliflower. For meat eaters, game is again an excellent choice for seasonal healthy eating – most modern game is lean and full of flavour so cook it simply on the griddle or quickly stir-fried. Venison, guinea fowl, wood pigeon, partridge and hare are all good in February, while the comfort eaters amongst you might try mutton for its rich flavour or a lovely piece of rare breed pork. Serve your meat with the best of all the cabbages and brassicas that are around now. They are another food area where we have moved on from the over-boiled servings from which our parents recoiled. Savoy cabbage, cauliflower, sprouts and purple sprouting broccoli all work perfectly in stir fries and curries, or serve them simply shredded and steamed tossed with a little seasoning, and a dash of cold pressed rapeseed oil. Main crop potatoes, Jerusalem artichokes, parsnips and turnips provide the starch that keeps us going in the cold so mash them together to go with your game dishes. Local fruit is sparse but there are still apples to be enjoyed – the storing varieties keep well until April so make sure to go on buying local when you see them. Despite the challenging season for many apple growers, the flavour is still sweet and fragrant for many crops. Early forced rhubarb is the cook’s friend now – wonderful in traditional crumbles, compotes and pies, it also goes well with rich flavoured meat and fish so serve a rhubarb sauce with grilled mackerel or spice it up with Chinese five spice and serve with slow-cooked belly pork. 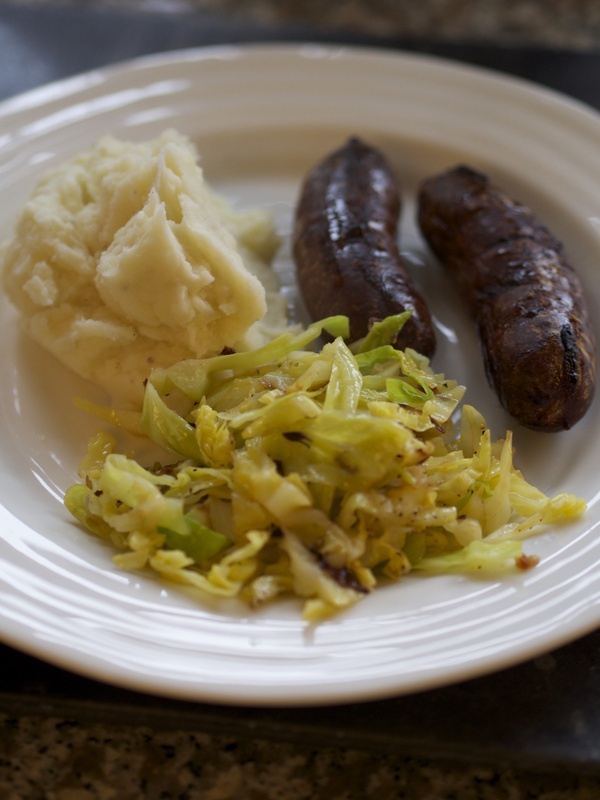 Try this simple cabbage dish with game dishes, bangers and mash or a chicken casserole. Melt a slug of local cold pressed rapeseed oil with a large knob of butter in a flameproof casserole until foaming. Add two finely chopped garlic cloves and cook for half a minute until pale golden but don’t let it burn or the flavour will be bitter. Add a finely shredded Savoy cabbage and plenty of seasoning. Stir to coat in the oil then cover the pan tightly and cook over a very low heat for about 10 minutes until the cabbage is really tender. Season with ground mace (the outside ‘bark’ from a nutmeg – use nutmeg instead) and serve. This entry was posted in Farmers Market, In season, Local food and tagged Cabbage recipes, Kent farmers markets, Penshurst farmers market, scallop festival. Bookmark the permalink. 1 Response to Banish those February blues at the farmers’ market….